Straight from the outset, the game wasn't serious, with spiral headbutts and fireballs. Street Fighter 2 has a strong claim for most popular beat ‘em up ever and it sparked a craze for the genre which ran throughout the nineties. It was unbelievably popular offering players a one on one combat experience which remained unmatched for years. Originally released by Capcom in arcades in 1991 it spawned a slew of home console versions. The most popular was the SNES port released in 1992 and that version remains Capcom’s highest selling title of all time shifting well over 6 million units. 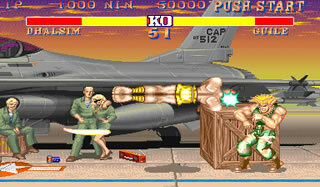 Street Fighter 2 built on the original which was released in 1987 adding new characters, bosses and game mechanics. The basic idea was to play a best of three rounds fight against an opponent and try to beat them into submission. Using a combination of directional attacks and punch and kick buttons as well as throws and holds and special attacks the combat system had a great deal of depth and allowed newbies to enjoy some success through button mashing while hardened pros could hone their craft to become master warriors. The game offered eight playable characters each with a unique fighting style and their own special moves (apart from Ryu and Ken who were essentially the same). The colourful and imaginative characters were one of the main reasons the game was so successful and there’s no doubt the premise of pulling together the greatest fighters from around the globe for a fighting tournament owed a debt to Bruce Lee’s classic film Enter the Dragon. In addition to the traditional looking martial artists Ryu and Ken players could choose to be the heavy weight sumo wrestler E. Honda, the crew cut US GI Guile, the bendy limbed yoga expert Dhalsim, the thick thighed female martial artist Chun Li, the Russian wrestling bear Zangief and my personal favourite the electric green monster Blanka. Each character had their own back-story which could only be resolved by completing the game with them. 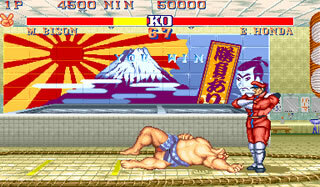 The single player game was essentially a knock out tournament and in addition to defeating the other characters players had to face the four bosses. First up was the US boxer Balrog, then the cage fighting masked Spaniard with the claw named Vega, then there was Sagat the eye-patch wearing Thai boxer and finally the dreaded M. Bison who resembled a frightening Communist military commander. The game was 2D and featured a cartoon art style with rich backdrops, great animations and some memorable visual effects. The cut scenes offered a nice reward for gamers determined enough to battle all the way through for victory. The depth was astounding and it took several hours to learn the multitude of moves available for even a single character. This was the game that introduced the concept of button combinations to trigger special moves and many of them were tough to pull off requiring several button presses and a directional swoop on the joystick or d-pad. If you could manage them then the special moves were hugely rewarding and ranged from Ryu and Ken’s classic fireball to Dhlasim’s teleportation and Blanka’s electrocution move. The game also featured some classic music and great sound effects and voice over work from the round announcer to Chun Li’s grating girlish victory giggle as well as the various groans and grunts of felled opponents. Many of the special attacks were accompanied by shouts from the characters most famously Ryu’s shout of Hadouken which accompanied his fireball special attack. Hadouken roughly means “wave fist” in Japanese and the fireball was supposed to represent a wave of spiritual energy. This much admired classic was ripped off by every fighting game that followed and established core concepts that have changed little in the genre. The game-play was damn near perfect and it provided countless days of fighting fun. Although there have been several versions released since the original none of them offer major improvements and this is a game that is still hugely enjoyable to play. If you are looking to offload some pent up aggression Street Fighter 2 is still a great way to do it.